JAMESTOWN – The Cornell Cooperative Extension of Chautauqua County received a grant of $6,000 this month for their 4-H Youth Program. 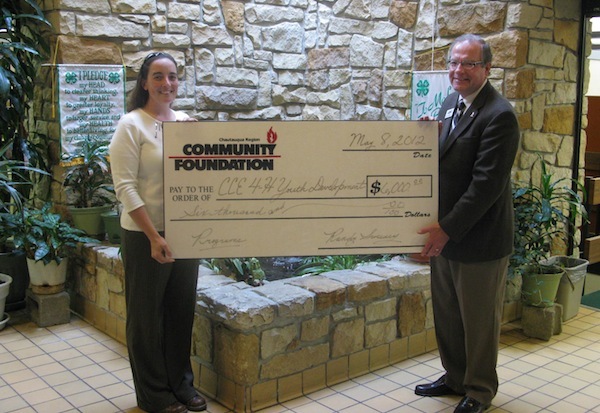 The Community Service grant, which was administered through the Chautauqua Region Community Foundation, was made possible by money from the Thomas H. Brown Fund and Lillian Brink Fund. An organization nationally known for their work with youth, the Chautauqua County Chapter currently serves 478 members between the ages of 5 and 19. Members are provided with over 200 hours of programming in a variety of disciplines, based on interest, as well as close to 150 hours of animal education classes. All programs fall into the four core values of the organization, head, heart, hands and health, thus the name 4-H.
With 68-percent of members living in rural areas, 4-H reaches out to those with limited access to youth development programs and provides them an opportunity to facilitate friendship, independence, generosity and a mastery of skills. After suffering funding cuts in 2011 and eventually losing all county funding in 2012, Emily Kidd, 4-H Issue Leader, is happy to have this grant to put into programs for the youth of Chautauqua County. The mission of Cornell Cooperative Extension 4-H Youth Development is to create supportive learning environments in which diverse youth and adults reach their fullest potential as capable, competent and caring citizens. For more information on 4-H Programming in Chautauqua County or to become involved, visit www.cce.cornell.edu/chautauqua. For information on donating to other Community Service Funds, contact the Community Foundation at 661.3390 or visit online, www.crcfonline.org.